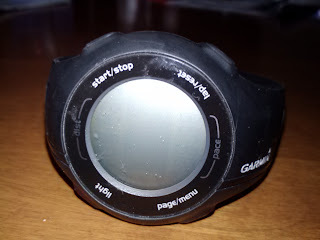 I originally thought the theme of today's post would be about my discovery that my Garmin was out of battery and that would force me to run outside without capturing any data. But that wasn't the way it played out. Instead, I ended up stopping my run almost as soon as it started. Nothing to do with technology this time. I was actually looking forward to running free of big brother NAVSTAR as I geared up for the cold morning temperatures (29°). I'll admit that I wimped out and put on my Garmin 60 to use as a stopwatch, but I didn't connect the foot pod or the HRM. So technically I was running free. However, between elapsed time and Gmaps, I could still calculate pace and distance. And you know I would have. After running fifty steps from my house on my way around the neighborhood, I realized that my hip soreness had not gone away. In fact it was fairly painful and I worried that continuing my run might only exacerbate the problem. I decided that getting in a routine run was not worth the possibility of further injury so I stopped, turned around, and headed home. I iced the spot for about 30 minutes and then continued my day that included lunch with a good friend. I considered doing an afternoon run if my hip felt better (it does) but decided instead to give it additional rest until tomorrow. I may go for a trail run at Stillwell on Saturday. In the past, the dirt surface has provided a good, softer alternative to pavement. It's a good surface to run on when dealing with an injury. Of course, if the temperatures are still below freezing tomorrow, the dirt may be just as hard as pavement. Feel better soon, ER.. good idea of ice and rest, and gentle stretch, if you can! Thanks TPP. I iced it again for a while and I'll give it a good stretch this morning. I'm hoping that will get me past this annoyance!